The human dentition is composed of two sets of teeth – primary and permanent. Teeth are organised into two opposing arches – maxillary (upper) and mandibular (lower). 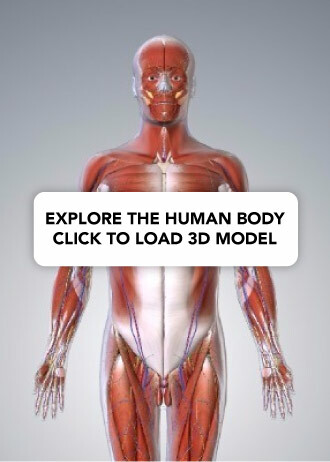 These can be divided down the midline (mid-sagittal plane) into left and right halves. Teeth are positioned in alveolar sockets, and connected to the bone by a suspensory periodontal ligament. In this article, we shall look at the structure of teeth, identifying teeth, and primary vs permanent dentition. The primary dentition is composed of 20 teeth, with 10 in each arch. There are five teeth in each quadrant, composed of two incisors (central and lateral), a canine, and two molars. These teeth are referred to as letters A, B, C, D and E. The primary teeth begin to erupt at 6 months of age. The permanent dentition is composed of 32 teeth with 16 in each arch. There are eight teeth in each quadrant, composed of two incisors (central and lateral), a canine, two premolars, and three molars. These teeth are referred to as numbers, 1 (central incisor) to 8 (3rd molar or ‘wisdom’ tooth). The permanent teeth begin to erupt, and replace the primary teeth, at 6 years of age. The permanent teeth complete eruption by approximately age 13 years – with the exception of the 3rd molar ‘wisdom’ teeth, which usually erupt by the age of 21 years. Fig 1 – Primary and permanent dentition. The eruption dates for each tooth are denoted in brackets. A tooth can be divided into two main parts – the crown and the root. The part of a tooth which is visible in the mouth is referred to as the clinical crown, while the part which is not visible is, by definition, the clinical root. Enamel is a robust, avascular hard tissue with a high mineral content. It is, in effect, designed to provide thermal insulation for a tooth, and to protect the internal vital tissues from destruction. Enamel is susceptible to dental caries, tooth wear and acid dissolution. Cementum is a softer, more sensitive tissue. It becomes visible if a tooth is extruded from the alveolar socket during a traumatic dental injury, and when periodontal disease (disease of the tooth supporting tissues) causes root exposure; a person becomes “long in the tooth”. A layer of dentine lies beneath the enamel and cementum, throughout the crown and root. Dentine is a vital, innervated tissue that accounts for the majority of the hard tooth structure. The part of the tooth where the dentine and enamel meet is called the dentineo-enamel junction (DEJ). The boundary where the anatomic crown meets the anatomic root (where the enamel meets the cementum) is called the cemento-enamel junction (CEJ). The pulp cavity is the space within a tooth root that is filled with the vital dental pulp, a pink mass of innervated, vascular tissue. The end of the root is called the apex. The apical foramen is the space at the apex through which blood vessels and nerves enter the dental pulp, and through which pulp infection may enter the alveolus and surrounding soft tissues. 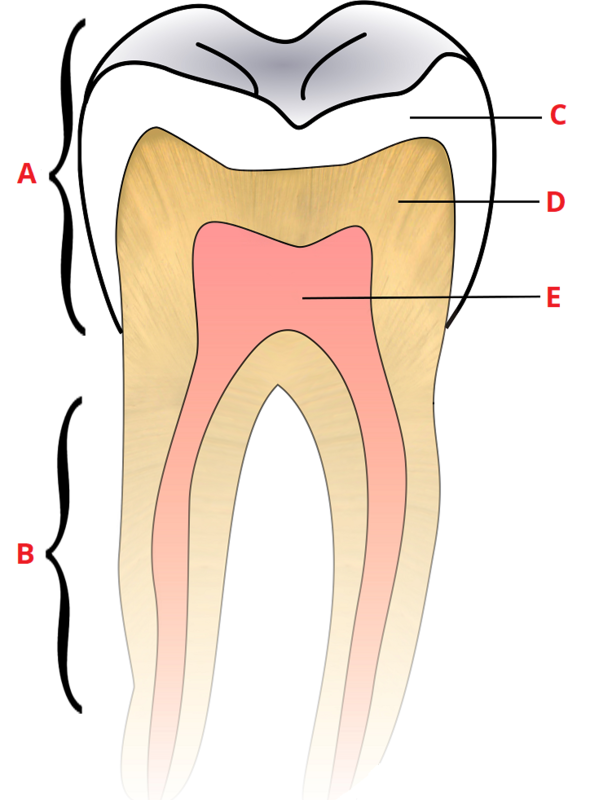 Fig 2 – Tooth structure. 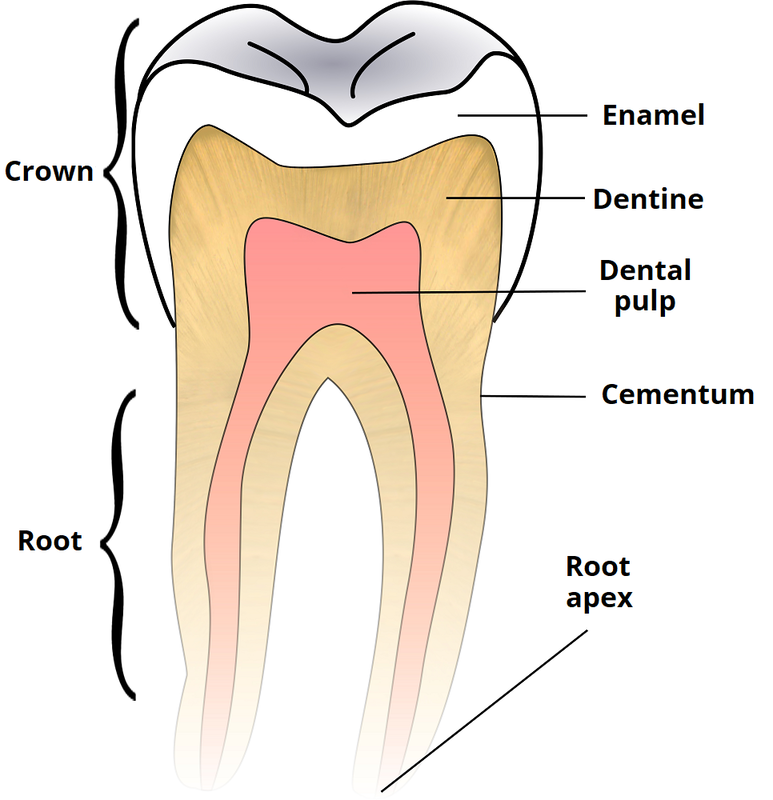 The anatomic crown is covered by enamel, whilst the anatomic root is covered by cementum. There are four main types of teeth – incisors, canines, premolars and molars. The premolars are only present in the permanent dentition. Note: There is an accepted order that is used when naming teeth: dentition, arch, quadrant, tooth type. E.g. permanent mandibular right lateral incisor. There are 8 incisors in both the primary and permanent dentition; 4 maxillary and 4 mandibular. Central and lateral incisors have straight edges that are designed to incise in to food. They are located at the front of mouth with central incisors nearest the midline, and lateral incisors between the central incisors and the canines. Incisor teeth, particularly in the maxilla, are at risk of damage during a traumatic dental injury, due to their relatively unprotected position, and their size and shape. Traumatic dental injuries are common in childhood (at least 1 in 10 children are affected). The consequences of traumatic dental injuries can be significant in terms of function, aesthetics, dental anxiety, and quality of life for affected children and their carers. 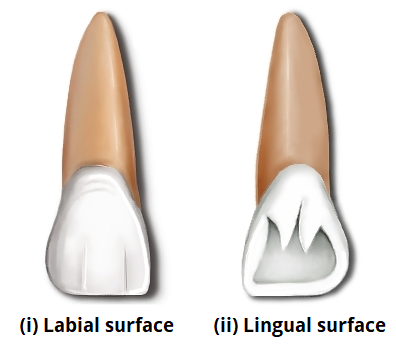 Fig 3 – Labial and lingual views of the maxillary central incisor. There are 4 canines in both the primary and permanent dentition; 2 maxillary and 2 mandibular. They are located at corners of the mouth and have an incisal edge that has a sharp, triangular shaped projection. The function of the cusp is to pierce and hold food. They are sometimes referred to as cuspid teeth. Canines have long stable roots that withstand greater forces than incisors. Teenagers who experience dental crowding (the total width of the teeth exceeds the available width of the arch for the teeth to erupt in to) may present with unerupted canines. These are frequently located radiographically in the palate, or high the buccal sulcus. Oral surgery may be required to aid the eruption of these teeth. The permanent dentition has 8 premolars that generally have 2 cusps, but this is not always the case. They are sometimes referred to as bicuspid teeth. They are located between the canines and the molars, and they share some of the characteristics of these teeth. There are no premolars in the primary dentition. Premolar teeth are frequently extracted by dentists to relieve dental crowding, particularly prior to orthodontic treatment. There are 8 molars in the primary permanent dentition; 4 maxillary and 4 mandibular. 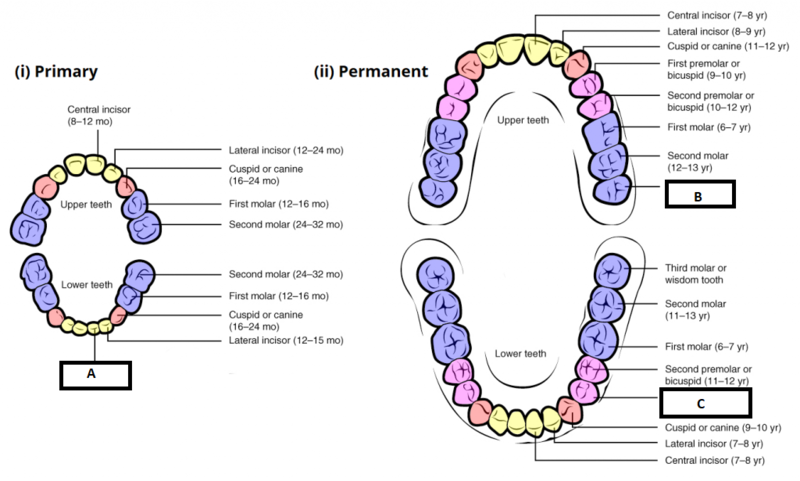 There are 12 molars in the permanent dentition; 6 maxillary and 6 mandibular. The number of cusps varies between 3 and 5. They are located at the back of the mouth, and are designed to crush and chew food, prior to swallowing. Molar teeth are particularly at risk of dental caries (decay) due to the presence of deep grooves that run across the occlusal (top) surface of the teeth, and due to the presence of a relatively wide point of contact between adjacent molars. These sites are more difficult to clean than the smooth walls of the labial (lip), buccal (cheek), lingual (tongue), and palatal (palate) surfaces of teeth. 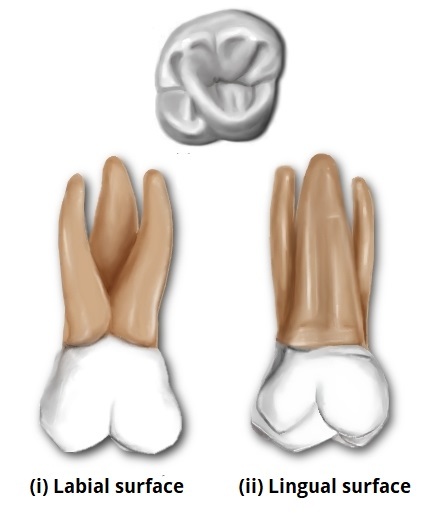 Fig 4 – Labial and lingual views of the maxillary first molar. What is the name given to the upper arch of teeth? Which type of tooth is only present in the permanent dentition? What structure is depicted by the label ‘A’?